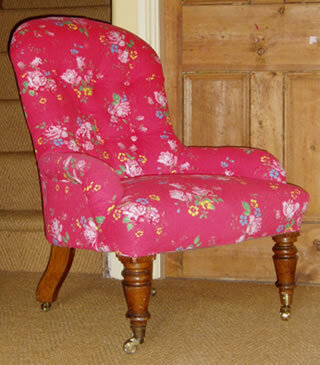 In upholstery, soft furnishings or loose covers. Bring your own project or projects. This is a mixed course for all skill levels. 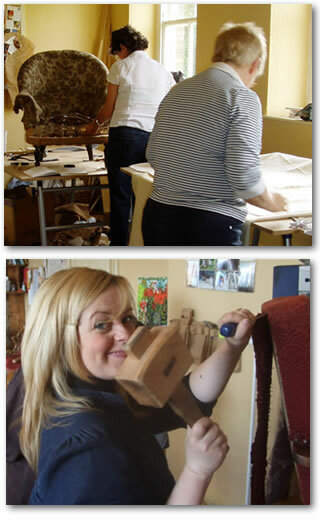 This course is designed for people who have a specific project or projects in mind; maybe you have an old chair that needs re-upholstering, or would benefit from a new loose cover to cheer it up; or perhaps you would like to make some new bedroom or living room furnishings. You can bring whatever project(s) you have in mind and I will teach you how to make it (them). The classes I run are very small with only 3 students at any one time. Because they are so small I can comfortably teach mixed classes with each student undertaking a completely different project. It is both fun and informative being able to look at another student’s work and learn from what they are doing and it is surprising how many skills learnt in say soft furnishings are just as relevant in upholstery and loose cover making. The techniques taught include: constructing upholstery foundations (webbing, springing, stuffing, stitched edges etc. ), how to calculate and cut out fabric, fitting the top cover and finishing techniques. 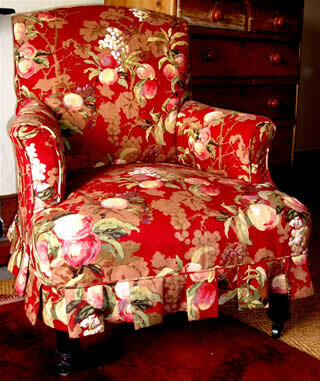 Where relevant, basic techniques for repairing furniture are also taught as well as deep and shallow buttoning, making piping, making foam, squab or sectioned feather cushions and box cushions covers. For those who are interested, you can also learn how to make a template. A student could expect to more or less complete a small bedroom chair with fully sprung seat and upholstered back but no arms in four days. In loose cover making Angie will teach some or all of the following: the planning, measuring and cutting of fabric (including pattern matching and calculating quantities for both plain and patterned fabrics), the cutting and fitting of the loose cover, different skirts, making piping, templates, fastenings, box cushions, different styles of cover, fabric characteristics, arm caps and fire regulations. It generally takes a full four days for a student to learn how to make a loose cover with a skirt and box cushion for an armchair. The term “soft furnishings” covers a large area. Here are some of the items it covers - curtains, unlined, lined and interlined with a multitude of different types of headings and finishes, tie backs for the curtains, pelmets, valances, swags and tails, blinds of various types, bed covers and bed heads (these can also be defined as upholstery), scatter cushions of every shape and size imaginable and different shaped pads to go inside the cushions. You could expect to complete a large pair (floor length) of interlined curtains with hand heading over 4 days, though Angie usually recommends that students only make one curtain and undertake another project as well in the workshop and complete the other curtain at home using the first as a template.